Traverse, Northern Michigan’s Magazine and Turtle Creek Casino are proud to spice up the evening of Tuesday, May 17th with the Red Hot Best of Northern Michigan Bash! Hosted on the hip, sophisticated third floor of Turtle Creek Casino, which is also sponsoring the event, this evening will unveil the winners of Red Hot Best Of Northern Michigan readers’ choice voting and provide guests with samples of the best Northern Michigan food, wine and music all under one roof. Tickets go on sale starting April 6th and can be found at MyNorth.com/tickets. “Party goers will be able to try the best of Northern Michigan and, at the same time, we will celebrate the people, the spirit, the generosity and the creativity found in the Up North region,” says Deborah Wyatt Fellows, founder and editor in chief of Traverse Magazine and president of MyNorth Media. 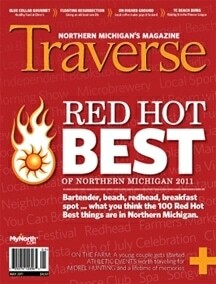 In February and March 2011, Traverse Magazine and MyNorth.com readers chose the best of Northern Michigan from more than 100 categories, ranging from best bartender to best breakfast spot. By the end readers generated 7,000 nominations. From these nominations, more than 8,000 voters chose the Best of Northern Michigan. The top three winners in each category have been invited to the event and all first, second and third place winners will be covered in the June issue of Traverse Magazine. In addition to a great party full of fun, The Red Hot Best of Northern Michigan Bash supports three local charities: The Leelanau Conservancy, Traverse Health Clinic and The Manna Project. The Leelanau Conservancy is an organization started in 1988 that works to protect the lovely places and character residing on the Leelanau Peninsula. Traverse Health Clinic is the only local network of volunteer medical professionals that delivers health care to the uninsured in the Traverse City area. The Manna Project is an organization assuring that no person in its distribution area of Emmet, Charlevoix and Antrim Counties goes hungry. 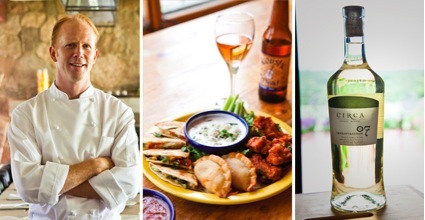 The June issue of Traverse Magazine is a guide to 300 of the best restaurants, hotels, attractions and sights. Advance sales of the June issue are available now in the MyNorth store. Partygoers will receive a complimentary copy of the June issue of Traverse Magazine. Tickets go on sale April 6th and may be purchased at our online store, MyNorth.com/tickets, the Turtle Creek Casino & Hotel gift shop and additional sponsor locations to be announced. Lastly, Turtle Creek Casino and Hotel, home to the best gambling in Northern Michigan, is a festive and beautiful backdrop for this event. As the gold sponsor for the Red Hot Best of Northern Michigan, Turtle Creek will showcase its facility, service and hospitality to all attendees. The third floor of the hotel, including the ballroom and Level Three Lounge, will be available for party guests to enjoy and mingle with fellow community members as well as Best Of finalists. MyNorth Media has also published Reflections of a Life Up North, a coffee-table book of stunning photography from Traverse Magazine paired with a collection of Fellows’s columns, The Cottage Cookbook and 101 Ways to Love Traverse City. MyNorth Media is also a proud sponsor of many events including the Traverse City Film Festival, Traverse City Comedy Arts Festival and the National Cherry Festival. The privately held company is headquartered in Traverse City, Michigan. For more information visit MyNorth.com or call (231) 941-8174.